chain profile New prototype moves nearly all food prep and production to the front of the house for this healthy eating fast-casual chain. By Toby Weber V isit a Coolgreens location and you may see more than team members making salads and wraps, or customers enjoying their meals. You may also find a yoga or spinning class, a lecture on nutrition or a how-to session on cleanses. That's because the chain, with headquarters in Oklahoma City, isn't motivated by profit alone. While the bottom line remains important, Coolgreens' mission of inspiring healthy communities also serves as a driving force in the chain's evo- lution, says CEO Robert Lee. Hosting exercise classes, lectures and even book clubs helps Coolgreens' communities stay healthy while "further connecting us to the community and introducing people to who we are and the food we provide," Lee says. The food, of course, plays a big role in Coolgreens' com- mitment to healthy communities. As the chain's name implies, Coolgreens offers a veggie-heavy menu, featuring salads, wraps, sandwiches, flatbreads and quinoa bowls, among other offerings. 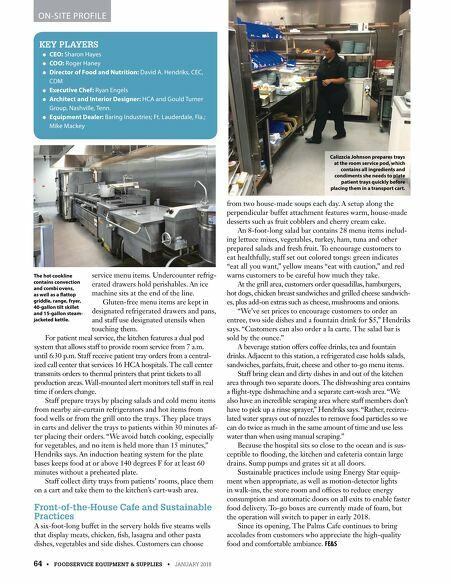 Coolgreens handles nearly all prep work for these items in-house. 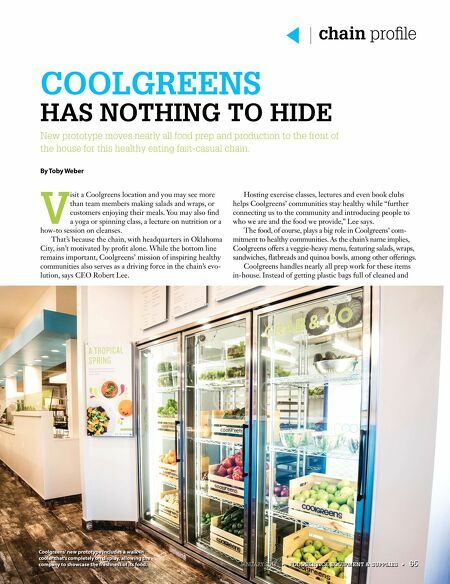 Instead of getting plastic bags full of cleaned and COOLGREENS HAS NOTHING TO HIDE JANUARY 2018 • FOODSERVICE EQUIPMENT & SUPPLIES • 65 Coolgreens' new prototype includes a walk-in cooler that's completely on display, allowing the company to showcase the freshness of its food.